It still seems that people are having issues with "Cannot upgrade AllClient installation to Notes client. The upgrade you are attempting is not supported" errors. Be very careful because it's easy to install the wrong webkit and then look up the error and change the installtype in the notes.ini ( btw changing the install type is not recommended under any circumstances and is not support by IBM ). Hopefully you are reading this and taking a second look. 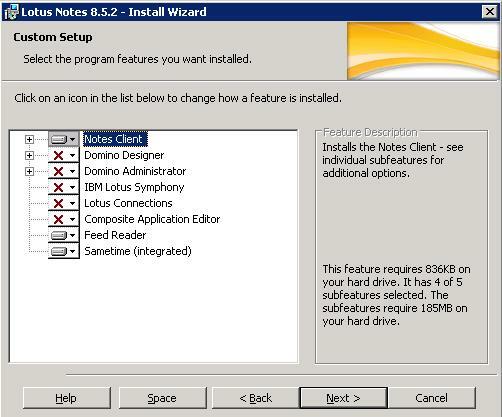 Right around the release of IBM Lotus Notes 8.5, the filename for downloaded Lotus Notes webkit files started changing with what seems to be no rhyme or reason. Before 8.5, the file names were the pack number ( CXXXXX ) I believe this may be confusing and causing an issue when upgrading older clients. Check the very end of this post for the file names and package names. The other scenario is that the older client was installed with the admin/designer/notes and only the notes client is selected. I've heard of people just downloading the admin/designer/notes client and installing that on all computers with only the client selected at install. BEWARE because if this is your case, your installtype will still be 2 even though you only have the Lotus Notes client portion installed which should be installtype 6, clear as mud right? If this is the case, you need to install the admin/designer/notes client when you upgrade and not the notes only client ( I'm not sure what license issues this could be causing with everyone running the admin/designer/notes client too ). To fix this, you need to manually uninstall the current notes client and install the client only. Last, IBM Lotus Notes version 8.0, 8.0.1, 8.0.2 all had a basic version of admin/designer/notes where 8.5 and later do not have a basic version of admin/designer/notes. This has nothing to do with instaltype but just wanted you to keep that in mind. -a standard ( Eclipse ) install can launch the basic client by adding the -sa in the shortcut. If the shortcut has the notes.ini appended after the exe, put the -sa in between. 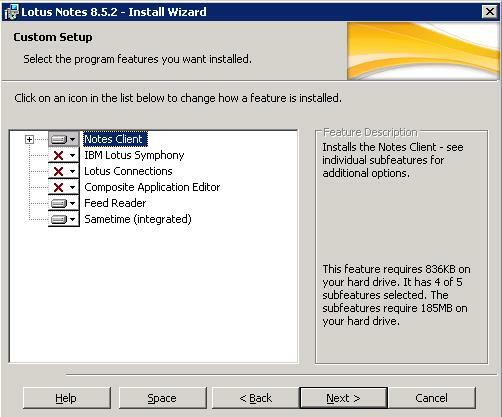 NOTE: like I stated above, if you install both these clients as is displayed on two different machines, they will only install the lotus notes portion of the client. However the install types are still different and you need to stick with the same install type. Even thought the All Client only has the Notes Client installed, you cannot install the Notes Client as an upgrade and vice versa. I'm almost tempted to buy this because of your pictures!